There are two official swimming beaches on the island and both are busy during the summer swimming season, particularly at weekends. Other parts of the island have sandy bays from which it is possible to swim, but these have no facilities and are rarely used, but are fine for playing on the sand if you want a quieter choice. 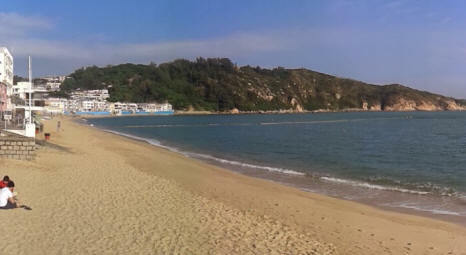 Tung Wan Beach - The larger of the two beaches this is long stretch of soft golden sand (pictured) with large changing rooms, and toilets, life guards, nearby snack restaurants that also hire out beach toys and swimwear, as well as two floating platforms and shark nets. A collection of small trees along the beach provide a small amount shade while the far ends of the beaches have small rocky outcrops. Overlooked by the Warrick Hotel and just 5 minutes walk from the Ferry Pier it is the number one choice for most visitors to the island. The path from the ferry pier is well signposted. Kwun Yam Beach - Smaller than Tung Wan this beach has coarser sand and only half the swimming area, but a quieter and more laid back style. With only minimal changing and toilet facilities it can't cater to a large crowd, but the popular beach bar attracts a crowd of locals residents particularly on weekends. Close behind the beach is a path leading past a small temple then up into the wooded hills. To reach Kwun Yam Wan Beach simply turn right and walk along the Beach Road with the sea on your left until you leave the main beach, and 3 minutes walk beyond you will see Kwun Yam Wan. You will walk over a small rocky headland that is between the two beaches, it also that connects to the Helicopter landing pad which is used for air ambulance evacuation flights taking patients from the nearby island hospital, while above is the Windsurfer Cafe in an old lifesaving association building. Not suitable for swimming due to the lack of lifeguards or shark nets, but a great place to enjoy nature and relax on the sand there are several sandy bays on the island that are very quiet even during the hight of the summer season. The largest and easiest to reach is Tai Kwai Wan which can be found to the north west of the island by following the coast road beyond the Pak Tai Temple. Continue on with the firestation on your right past boat yards, past the mini-organic farm on your right and head up the hill towards the Cheung kwai public housing estate, then over the hill and as you walk down you will see the beach. Harder to reach and much smaller is Pak Tso Wan also known as Italian Beach or Afternoon Beach due to it's southerly location makes it a great place to watch the sun go down on an afternoon in the cooler weather, when the main beaches are sometimes too cold as they face away from the sun. Take either the coast road or the sam pan ferry to the westerly Sai Wan, then follow the road up through the Canadian CARE Village and as you leave the village and walk uphill watch for a sign just before the graveyard pointing out steps to the right leading down to the beach.